Through 7 fun filled activities that feel like play, children develop literacy skills. Bailey and his friends inspire early readers to learn letters, words and word families, rhyming, prepositions, adjectives and storytelling. Learning the alphabet is great fun with the letter machine. Kids click on a letter or press a letter on the keyboard to see dinosaurs dance, rhino´s roller skate and more. Each screen shows the letter both uppercase and lowercase with words and a crazy picture that emphasizes that letter. The letter is spoken along with the words. Kids will go wild over Goats Gobbling Gumdrops and Monkeys Making Music. Kids create their own stories and watch Bailey and his friends as they act out the stories. Children can also print the stories and fold them into books. Rhyming is silly and really fun when kids make Mother Goose rhymes with a twist. Children choose pictures to complete crazy rhymes that will have them laughing and learning. The Three-Letter Carnival is a unique phonics activity that helps kids sound out three letter words. Children begin by choosing pictures and listening to the spelling of the word. The word is also sounded out. When players are ready they can choose the Rhyming Coaster or play with beginning letter sounds. This crazy coaster carries pictures of things that rhyme or begin with the same letter. Words are repeated again and again as the coaster takes off for a ride. Edmo the Clown and Houdini the dog are playing at the dog house and teaching kids all about prepositions. Edmo and Houdini will go in, out over, under, on and behind the doghouse. Children can also make a funny friend while they explore adjectives and make fun greeting cards to print. Activities have two modes, Explore and Discover and Question and Answer. Kids learn while exploring freely in the first mode and can then play fun games in the second mode to test their knowledge. 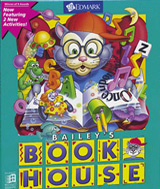 Kids will love reading and playing with Bailey and his friends in Bailey´s Book House. Comments: This is a good game for the young and new to pc games. Your told a story that has live avatars playing out the story for you. Wheather it makes you learn a song and sing along or they bust dance moves to make you groove out of your seats. While teaching you numbers letters and more all will enjoying yourselves. Comments: This is a good game to introduce your young child to the world of learning. While having fun they will learn their letters, easy words, rhyming, story telling and much more.